Note: The charts in this commentary have been updated to include the Q3 2018 Third Estimate released this morning. Let's take a closer look at the contributions of GDP of the four major subcomponents. The data source for this chart is the Excel file accompanying the BEA's latest GDP news release (see the links in the right column). 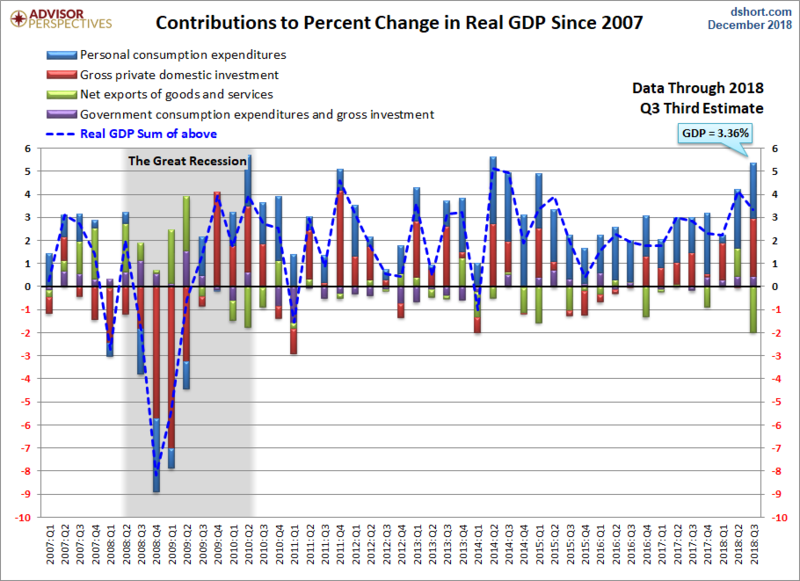 Specifically, it uses Table 2: Contributions to Percent Change in Real Gross Domestic Product. Note: The conventional practice is to round GDP to one decimal place, the latest at 3.4%. The GDP in the chart above is the real GDP calculated to two decimal places. Here is a chart of the latest estimates. Over the time frame of this chart, the Personal Consumption Expenditures (PCE) component has shown the most consistent correlation with real GDP itself. When PCE has been positive, GDP has usually been positive, and vice versa. In the latest GDP data, the contribution of PCE came at 2.37 of the 3.36 real GDP, up from the previous revision and still a positive contribution to Q3 GDP.